Tokyo is in the spotlight as the Olympic torch has been bestowed upon the prospective city for the 2020 Games. If you're planning on booking your ticket for a visit before the metropolis becomes a full frenzy, we'd like to recommend a lesser known area for all the foodies out there! Here's a suggestion from Commune's owner Aki during her last trip. Kappabashi-dori (or just Kappabashi) is located within Tokyo's Asakusa district, home to the city's most famous temple, Senso-ji. Though Kappabashi is a stretch of a couple blocks, there's no mistaking the "Kitchen Town" with the iconic giant chef of Niimi Kitchenware, the street's popular cooking supply destination, resting atop of the building and seemingly greeting its onlookers. From Michelin-starred restaurants to small scale izakayas, every chef in Tokyo has made a visit to Kappabashi. 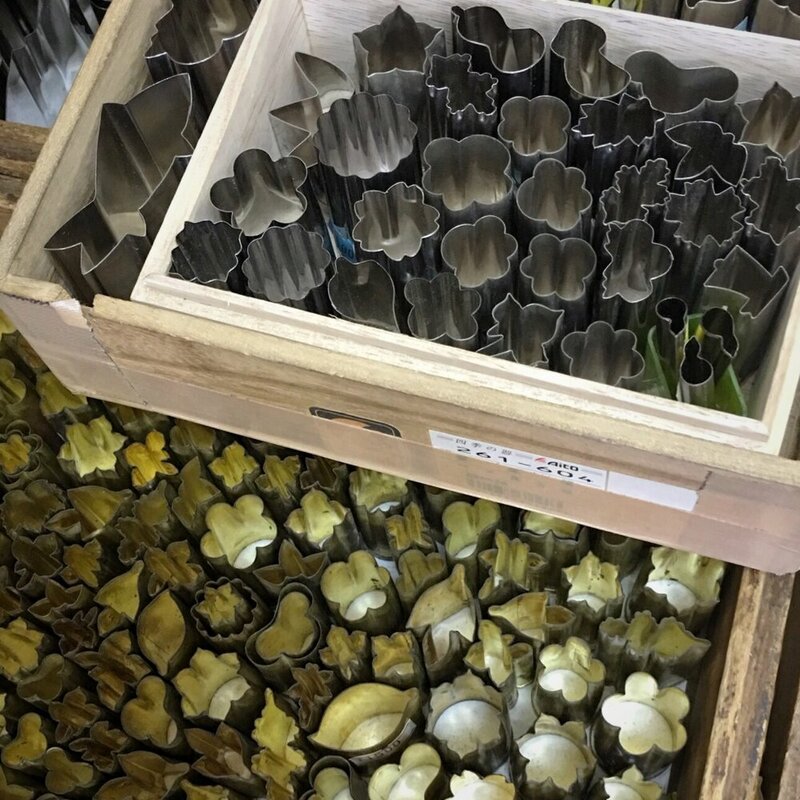 A wholesale paradise of everything a kitchen requires and then some; many stores specialize in one item, like coffee equipment, lacquered goods, handwoven baskets and brushes. 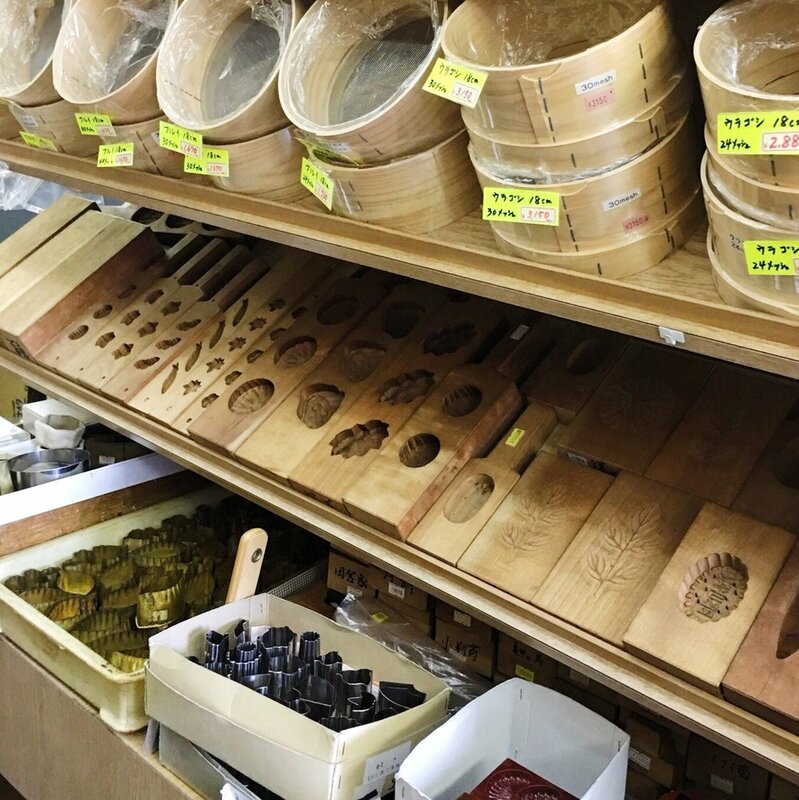 Below are a few tools used to make delicious manju, Japanese traditional confections. 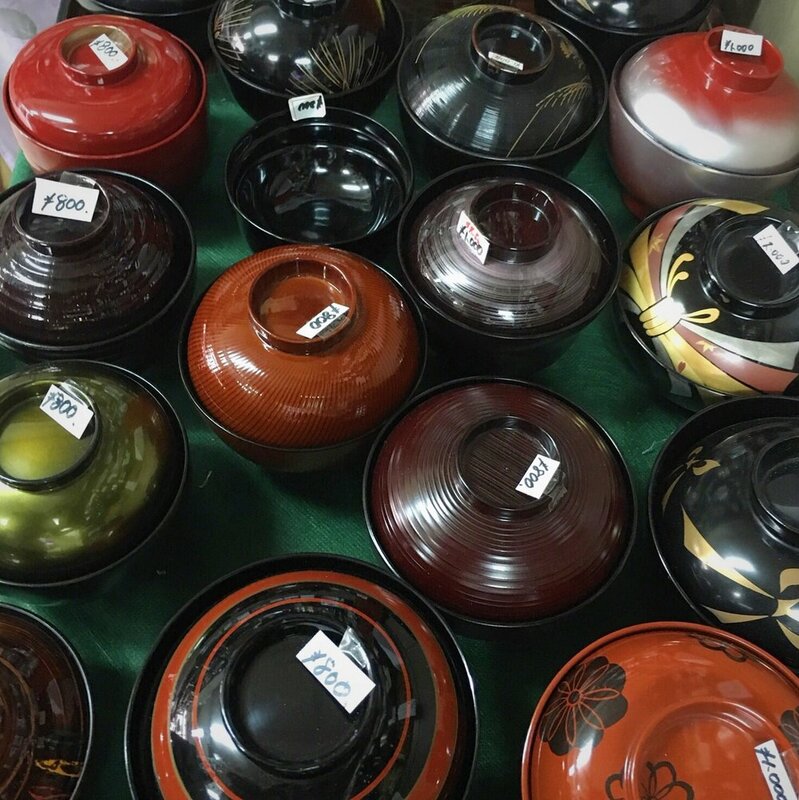 A worthwhile shopping trip, stock up on every home good imaginable and get a souvenir or two, Kappabashi is also a mecca of crafted plastic foods restaurants use for display! The closest station is Tawaramachi Station on the Subway Ginza Line, take the number 3 exit, walk a short distance till you find Niimi's jumbo chef! Steeped in history, we explored its origins and crossover from beloved treat to growing trend. Long before its gastronomic fervor, matcha was the drink of choice for meditating monks and the aristocratic elite. Tea had already been an import from China by traveling Buddhist priests, but powdered green tea, along with Zen Buddism, was adapted later on by Japanese monk Eisai in 1191. Grown and produced in Kyoto, the tea leaves were roasted, grinded into a fine powder, then blended into hot water with a whisk. For monks who spend hours meditating, the health and caffeine benefits were certainly a perk! From the very first seedling, growing matcha is methodical. The groves of tea leaves are shaded to allow the chlorophyll and amino acids to increase its brilliant green color and flavor, respectively. As a means to gain sunlight, the young leaves grow wider but thin. They are plucked, steamed to halt fermentation, then sifted and dried, and finally milled to its fine powder form. Even with the modernization of technology and hand-picking replaced by machines (though some plantations still do it by hand, it's rare), the actual stone grinding hasn't compromised its process. Many now electric, the stone grinders are constantly moving at a steady pace all day to produce only 30 grams of matcha. Infusing principles of wabisabi, the Japanese tea ceremony was formed to honor Zen principles of spirituality, simplicity and natural space. Soon the ritual became high culture as it was included in the homes and gardens of noblemen. The tradition has continued to be enjoyed in the realm of cherished ritual. The etiquette in chado (literally "way of tea") and its elaborate simplicity is certainly an awe-inspiring experience. Matcha is prepared two ways - "koicha" a thick blend of more powder to hot water and "usucha" a frothy thinner blend. Both are meant to underline the true flavor of matcha while creating a moment of serenity. A slurp of the last drop is customary for not only showing appreciation of the ceremony and preparation but to inspect the bottom of the chawan (tea bowl) for respect of the craftsman's pottery work. Aside from its ceremonial presentation, matcha has been consumed for health and mixed in desserts for decades in Japan. With the production of matcha becoming more efficient and available, matcha could be bought at a lower price and global franchises in Japan like Starbucks and snack companies began to serve matcha latte and matcha flavored Pocky and Kit-Kat bars. Soon matcha was not only a beloved national flavor, but a marketable export. Rich in antioxidants and uplifting caffiene, health nuts have flocked to enjoy the many benefits of matcha as a coffee alternative. However as Japanese cuisine has become more familiar on the American palette and fused with favorite sweets, we've emerged into the right time and place for innovators, patissiers and baristas to show the variety of uses of matcha. For foodies, the entrance of the word "umami" in culinary jargon has everyone curious how the sweet and bitterness of matcha can reveal itself in confectionary recipes. The allure of matcha's history and its unmistakable flavor continues to captivate everyone. For traditionalists, venture to Atelier TD for top-notch blends in Williamsburg. Owner, tea specialist and graduate of legendary tea house Urasenke, Stefen Ramirez educates his guests about the wonders of tea. Be sure to sign up for their newsletter for tea tasting events and follow them on Instagram for incredible photos! Whether you're fascinated by its culture, wellness or culinary versatility, there's so many ways to incorporate matcha in your everyday. Try out this delicious granola recipe for starting out the day with matcha! 2. In a separate bowl, combine wet ingredients and stir. 3. Pour over oats, sesame, seeds and dried fruits, mix well. 4. Spread evenly on rimmed sheet pan. 5. Bake for 40 min. A big part of Commune is our connection with the community. Since our move from Grand Street, we lost some of the foot traffic frequented from Bedford, but we've immediately become inspired by other businesses on our block as they continue to evolve and prove that Williamsburg is still an expanding neighborhood of creativity and innovation. Take our newest neighbor, East River Pilates. In just two years, owner Kimmy Kellum has taken her practice from an apartment rooftop to a studio space at the base of the Williamsburg Bridge to her final footing here on the corner of South 1st Street. East River Pilates' new found home has beautifully transformed the renovated space as a haven for wellness, routine fitness and community. Collaboration has played a key role in bringing East River together. Their new logo and website were designed by Bernadette Marie Pascua, a client of Kimmy's, whose background in fashion illustration seamlessly fit into the space's playful, yet serene aesthetic. As a huge proponent of "passion partnerships", Kimmy believes in a stronger community through exchanging creative talents and ideas. Throw in a couple of free classes and it's hard to turn down a good deal! The airy space is just in the early stages of its interior decorating with painted work by Bernadette on the way. You might notice the gold accents Kimmy has chosen - including our Gio Brass Baskets! We're sure that the studio will blossom into one of the neighborhood's favorite go-to destinations! Get ready to break a sweat! Check out their recent mention on W Magazine and their website for class details, schedules and more! If you’re like us, you like to dine out and enjoy everything this gastronomic city has to offer. New York City is abuzz with tourists and locals alike, as summer is a perfect time to discover your go-to happy hour bar or cozy restaurant for a dinner date. At Commune, we have no shortage of clients telling us their recent food outing or asking us for local recommendations. While we have our share of neighborhood favorites, we also love to venture and experience new places in the area. Here’s the latest restaurant on Commune’s approval list! After your next hair appointment, take South 4th and head east over the Brooklyn Queens Expressway. On the corner of Rodney Street, an open window bar welcomes you like a city oasis. Lined with dreamy white curtains, we couldn’t ask for a better time for a new tapas place in Williamsburg. 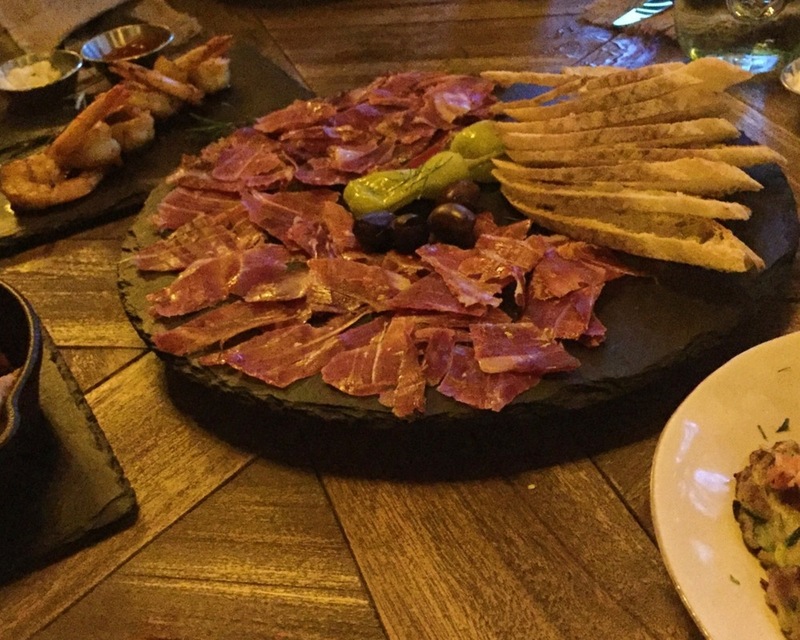 Naïve is a midsummer treat for a juicy sangria and Iberico cured jamon (meat lovers will rejoice!). Our staff had a wonderful night out in the back room seating, the space alit with eclectic chandelier light and grinning moon décor. The service was especially kind and courteous (thanks for taking our group photos!) and we loved the intimate atmosphere. Be sure to check it out next time you're in the neighborhood!